Lights, cameras, fashion! Last Sunday officially kicked off the 2019 award season with the Golden Globes. Like previous years, those who walked the red carpet did not disappoint. Attendees wore bright colors, which juxtaposed to the black attire worn last season; however, men's fashion seemed to consist of a variety of black pieces. Last year’s wave of dark fashion was worn in solidarity with the Times Up movement, the movement against sexual harassment across different industries. Though this season was more colorful, there was still reminisce of the movement in the form of ribbons and bracelets. One word describes the fashion on the carpet: dramatic. 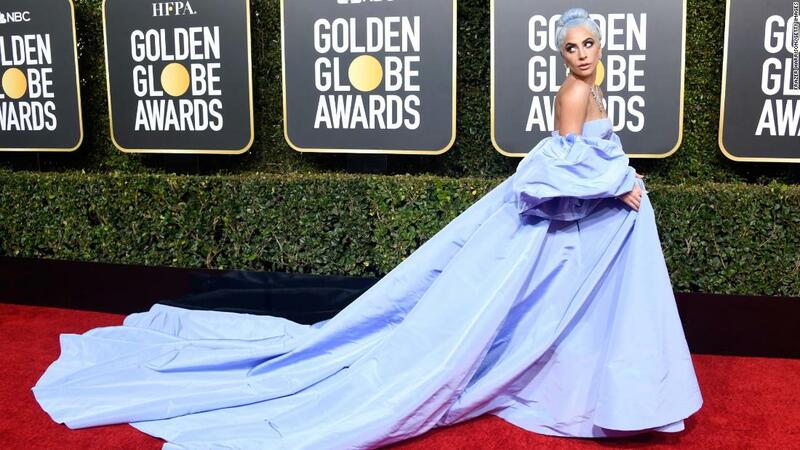 Celebrities brought the capes, chains, trains, and sequins out to play on this year’s carpet while others challenged gender norms contributing to the rise of a more inclusive fashion. This year’s Golden Globes red carpet was not only memorable, but a pivotal point to what we’ll see on red carpets to come. In a custom Alberta Ferretti dress, King’s curves are complemented well with the dress’s strapless hourglass shape. From top to the bottom, the dress shined full of sequins that caught the flashing camera lights, she took that night. Though the dress was newsworthy, what she did that night was even more important. As she accepted her award for the best supporting film actress, she promised that all the projects she will produce will consist of fifty percent women. She’s working towards shattering the glass ceiling that so many women face and she’s looking great doing it. We are obsessed! Rocking a suit decorated with sequins and flowered details along with an impressive cape, Porter was hard to miss. Not to mention, he had a quartet of brooches by Oscar Heyman that were valued at $360,000—he definitely did not come to play this award season. This custom couture get-up created by Randi Rahm has garnered mixed reviews. 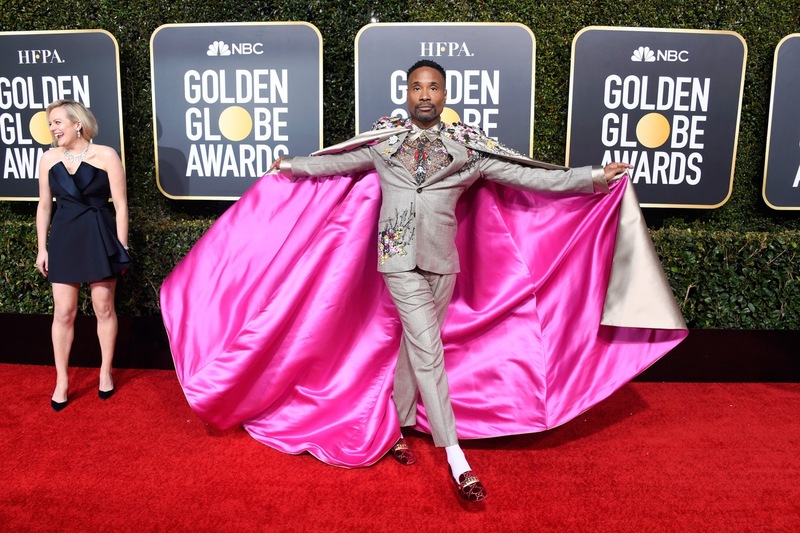 On the carpet, Porter was sure to open the cape to reveal the hot pink lining to capture the true dramatics the outfit elicited, which was exactly what Porter was hoping for. Some appreciated and praised Porter for his bold outfit choice while others found it meme-worthy. No matter the case, Porter differently lit up the red carpet! Though it is not unheard of women wearing tuxedos to red carpets, Greer’s look still seemed to turn heads. Unlike other tuxedos actresses have worn in the past, Greer’s tux was loose-fitting and gender-neutral. It was refreshing to see women like Greer break out of the traditional gown to an outfit that challenges gender norms while looking good doing it. Fashion choices like this help lift the stigma of masculinity and femininity being particular to a certain gender. Is fashion inherently gender-specific or do we just assume so? Nonetheless, Greer has made an impression on the carpet this year and encourages open-minded fashion choices on future carpets to come. Nyong'o walked the runaway in a fashionable custom cobalt blue dress with silver drop beads by Calvin Klein. However, Nyong'o decided to shake up her look, specifically with her shoes—her very affordable shoes. Walking among stars with shoes costing thousands of dollars, Nyong'o walked in $45 heels! Say what? Not only did it not take away from her beautiful look, but it also provides a layer of reality that is often unseen on the red carpet. She proved that you can be affordable and still make a statement! Of course, Chalamet had to do something more than just wear all black. With one addition, Chalamet stood out against many other men who wore black ensembles. He sported a sequined Louis Vuitton harness. His harness brought a new swing to men’s fashion this year, but ultimately it became a fashion risk that we think totally paid off! GQ praised Chalamet’s fashion choice and claimed its "the future of menswear." If that’s so, we should be excited for what’s to come with harness fashion. Chain mail is coming back in 2019, who would have known? Ronan not only rocked the chain mail, but she made it her own. In her dress by Gucci, it was sure to turn some heads. Ronan stood out in the crowd with her deep plunge dress that was both revealing and unrevealing at the same time. Though Ronan dressed to impress, she later reported that she left the awards right after she presented the Best Actor in a Comedy. She explained on Ellen, that she left to eat pizza with her friends in pajamas. We love a girl who can go from classy to comfortable with ease! American Horror Story heartthrob continues to challenge the gender norms enforced by society. In his Maison Margiela outfit, from shirt to shoes, Fern walked the carpet in an all-black outfit consisting of a black top with a mesh panel and “hoof-like” shoes that drove the internet wild! Not to mention, he had curled his hair and applied dark eyeshadow to complement his elevated tuxedo look. Eyeshadow is not new for Fern since we have seen him wearing it on almost every red carpet since the release of American Horror Story: Apocalypse. Fern’s daring look made it onto many best-dressed lists and demonstrates gender fluidity, a theme not showcased nearly enough on red carpets today. As elegant as ever, Gaga in her Valentino couture dress floated down the red carpet. Her dress included an impressive train that solicited the help of two people to carry it behind Gaga. The color of the dress has been debated, but a safe pick for Gaga in a soft purple. 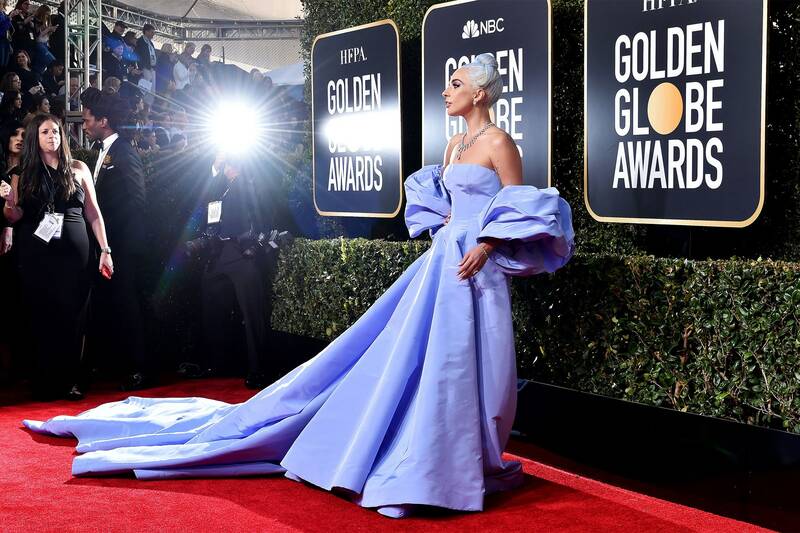 Gaga’s dress is said to pay homage to the dress Judy Garland wore in the 1954 version of “A Star is Born.” Her hair was colored to complement the dress in a classy updo. With such a big dress, it could swallow up the person wearing it; however, Gaga definitely was wearing the dress rather than it wearing her. We approve Gaga!